Reading and share top 20 famous quotes and sayings about Abridged by famous authors and people. 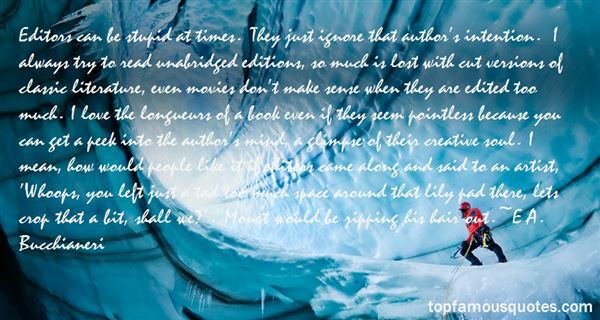 Browse top 20 famous quotes and sayings about Abridged by most favorite authors. 1. "Many a long dispute among divines may be thus abridged: It is so; It is not so. It is so; it is not so." 2. "Some of us find our lives abridged even before the paperback comes out." 3. "At each increase of knowledge, as well as on the contrivance of every new tool, human labour becomes abridged." 4. "I am torn open, unabridged, hot and a bit crazy inside. This is the feeling which belongs to me, she has always been mine." 5. "Editors can be stupid at times. They just ignore that author's intention. I always try to read unabridged editions, so much is lost with cut versions of classic literature, even movies don't make sense when they are edited too much. I love the longueurs of a book even if they seem pointless because you can get a peek into the author's mind, a glimpse of their creative soul. I mean, how would people like it if editors came along and said to an artist, ‘Whoops, you left just a tad too much space around that lily pad there, lets crop that a bit, shall we?'. Monet would be ripping his hair out." 6. "A boy adopts a hero for two reasons: because a hero captivates his soul and serves as a projection of his innermost self; and, because a hero seems to have solved many problems that may worry a boy, or at least demonstrates the capacity to solve them. The hero is an idealization of successful living, even though he may die in a story. The death may be gallant, brave, tragic, or perhaps even foolhardy. But living or dead, a hero is the stylistic embodiment of living on one's own terms – noble terms, grand terms, exciting terms – terms, in short, that complement any youth's uncorrupted, untamed, unabridged projection of what is possible to him in life"
7. "Every couple has two stories - the edited one to be shared from the couch and the unabridged version best left alone." 8. "May I gain no victory that harms me or my opponent. May I reconcile friends who are mad at each other. May I, insofar as I can, give all necessary help to my friends and to all who are in need. May I never fail a friend in trouble.-- Prayer on the Golden Rule (abridged)"
9. "I am going to bed. i will have nightmares involving huge monsters in academic robes carrying long bloody butcher knives labeled Excerpt, Selection, Passage, and Abridged." 10. "The civil rights of none shall be abridged on account of religious belief or worship, nor shall any national religion be established, nor shall the full and equal rights of conscience be in any manner, or on any pretext, infringed." 11. "On one memorable occasion Vronsky played all the parts in an abridged version of Anna Karenina when the rest of the cast were on strike for more blinis." 12. "Author's Note: I wanted to read the book that would begin to answer some of my questions, because I felt I couldn't write it... I also doubted my ability to handle monsoon and slum conditions after years of lousy health. I made the decision to try in the course of an absurdly long night at home alone in Washington, D.C. Tripping over an unabridged dictionary, I found myself on the floor with a punctured lung and three broken ribs in a spreading pool of Diet Dr Pepper, unable to slither to a phone. In the hours that passed, I arrived at a certain clarity. Having proved myself ill-suited to safe cohabitation with an unabridged dictionary, I had little to lose by pursuing my interests in another quarter-- a place beyond my so-called expertise, where the risk of failure would be great but the interactions somewhat more meaningful." 13. "For we may remark generally of our mathematical researches, that these auxiliary quantities, these long and difficult calculations into which we are often drawn, are almost always proofs that we have not in the beginning considered the objects themselves so thoroughly and directly as their nature requires, since all is abridged and simplified, as soon as we place ourselves in a right point of view." 14. "If in the past people would listen to music out of love for music, nowadays it roars everywhere and all the time, "regardless whether we want to hear it", it roars from loudspeakers, in cars, in restaurants, in elevators, in the streets, in waiting rooms, in gyms, in the earpieces of Walkmans, music rewritten, reorchestrated, abridged, and stretched out, fragments of rock, of jazz, of opera, a flood of everything jumbled together so that we don't know who composed it (music become noise is anonymous), so that we can't tell beginning from end (music become noise has no form): sewage-water music in which music is dying." 15. "You thought I didn't notice the way you two looked at each other? I may be old but I'm not blind. I remember thatfeeling. 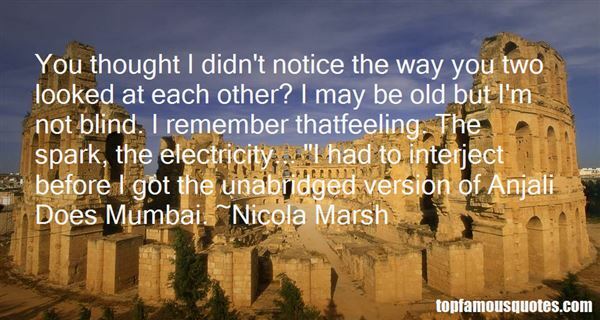 The spark, the electricity... "I had to interject before I got the unabridged version of Anjali Does Mumbai." 16. "So, once again, I ignored my poor, repressed libido--which was currently clamoring for me to lure Ryu behind the counter and knock him out with an unabridged dictionary in order to make him mine--and went ahead and started in on what he wanted to know." 17. "If a householder is a genuine devotee, he performs his duties without attachment; he surrenders the fruit of his work to God - his gain or loss, his pleasure or pain. Gospel of Sri Ramakrishna (Abridged)"
18. "Mentor's Official and Complete Procedural Handbook on Initial Succubus Intake and Probationary Period (Abridged)."Abridged?" I spun toward Jerome. "Tell me you're getting back at me for the time I accused you of wearing Old Spice. ""That one's still coming," said the demon. "This one's for real." 19. "Reading is one of the true pleasures of life. In our age of mass culture, when so much that we encounter is abridged,adapted, adulterated, shredded, and boiled down, it is mind-easing and mind-inspiring to sit down privately with a congenial book..."
20. "This is the whole of the story and we might have left it at that had there not been profit and pleasure in the telling; and although there is plenty ofspace on a gravestone to contain, bound in moss, the abridged version of a man's life, detail is always welcome." The money I've earned has enabled me to keep my life in my own hands. I had a terrific body, and I got paid for using it."